As is the case with uniform numbers, not all letters of the alphabet are equally gifted with hockey talent. A few are overflowing, others have only a smattering -- and one, the letter X, has none at all. 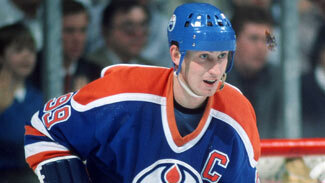 Great hands and great size helped Andreychuk score 640 goals in 23 seasons. He was one of the most lethal players ever on the power play and made life miserable for goaltenders. Andreychuk capped his career by captaining the Tampa Bay Lightning to their only Stanley Cup in 2004. 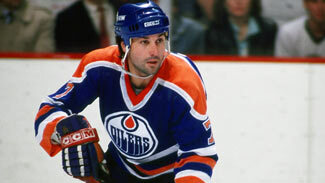 Though overshadowed by some of his teammates during the dynasty years of the Edmonton Oilers, the Hall of Famer scored 499 goals and won six Stanley Cups -- five with the Oilers and another in 1994 with the New York Rangers. The Ottawa Senators captain is still a productive player at age 39. He's coming off a 27-goal, 59-point season in 2011-12 and has 416 goals and 1,082 points -- all of them for the Senators, the only NHL team he's played for. The winningest goaltender in regular-season history (656 victories) will be back with the New Jersey Devils for at least two more seasons after signing a new contract this summer. He's raising the bar on wins and shutouts (119) so high it's hard to believe anyone will ever catch him. Beliveau was the cornerstone of the Montreal Canadiens dynasties of the late '50s and late '60s. Bourque was one of the best defensemen ever to play the game. Bossy had 573 goals in 10 seasons before retiring due to a back problem and was the sniper on the New York Islanders' dynasty teams in the early 1980s. Though he turns 35 in October, the slick Philadelphia Flyers forward is still productive -- he figures to pass the 300-goal and 700-point marks this season. Only Bobby Orr in his prime put up offensive numbers from the blue line the way Coffey did -- and Coffey's career was twice as long. Coffey's 1,533 points are the second most by a defenseman in NHL history, and he won four Stanley Cups. Clarke was the captain and focal point of the Philadelphia Flyers' Stanley Cup teams in 1974 and '75. Ciccarelli scored 608 goals on the way to a berth in the Hall of Fame. Crosby owned a Hart Trophy, a scoring title and a Stanley Cup before he was 22. Concussions have slowed the Pittsburgh Penguins captain in the past couple of seasons, but when he's healthy he's the best player in hockey. Dionne was the last player to win a scoring title before Wayne Gretzky ran off eight in a row in the 1980s and was part of the Los Angeles Kings' famed "Triple Crown Line." Dionne is fourth all-time with 731 goals and fifth on the points list with 1,771. Delvecchio spent all of his 24 NHL seasons with the Detroit Red Wings, playing 1,549 games and scoring 456 goals. Dryden broke into the NHL late in the 1970-71 season and left after '78-79 -- but not before leading the Montreal Canadiens to six Stanley Cups. He scores, wins faceoffs, is the NHL's top puck thief, plays as well defensively as any forward since Bob Gainey, and is among the NHL's best in the shootout. There's not much the Detroit Red Wings' No. 13 can't do. 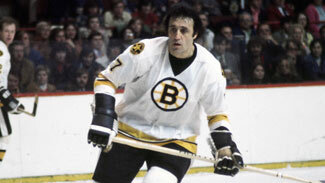 It's easy to forget now what a scoring machine Esposito was in the late '60s and early '70s. It was his single-season scoring marks that fell to Wayne Gretzky -- but 76 goals and 152 points in 1970-71 were every bit as remarkable as the Great One's totals a decade later. Esposito's dreaded snap shot helped him pile up 717 goals. Phil's younger brother had a Hall of Fame career of his own keeping pucks out of the net. His 15 shutouts as a rookie with the Chicago Blackhawks in 1969-70 are the most by a goaltender since 1927-28 (when the rules were different), and the 76 he piled up in his 16 NHL seasons are ninth on the all-time list. The all-time leading scorer in New Jersey Devils history needs six points to reach 900 and has been part of two Stanley Cup winners. At 36, he's coming off a season when he led the Devils with 78 points and helped bring them within two wins of another Cup. Perhaps the best two-way center in NHL history, Francis was solid in his own zone -- and he's fourth all-time in points with 1,798 and second to Wayne Gretzky in assists with 1,249. Francis' acquisition by Pittsburgh in 1991 filled a huge hole and helped the Penguins win back-to-back Cups. His numbers don't match some of the other great goaltenders because his teammates were more concerned with scoring, but Fuhr was the man in goal during the Edmonton Oilers' dynasty years from 1984-90. If you count non-NHL performances, Viacheslav Fetisov, whose time in North America was preceded by years in the Soviet Union when he was known as the "Russian Bobby Orr" would make him a candidate. The first player chosen in the 2003 NHL Draft has won 226 games (42 last season) and owns a Stanley Cup ring. The Pittsburgh Penguins' netminder is on a pace that could get him to 600 wins by the time he calls it a career. This is the biggest no-brainer of them all. Gretzky was great from the moment he stepped onto an NHL rink in 1979 to the afternoon in April 1999 that he called it a career. He still owns huge swaths of the NHL record book, and many of his scoring marks will last for generations. Gartner's brilliance was his consistency. He reached the 50-goal mark once but owns the record for most 30-goal seasons with 17 (15 of them in a row). Fellow Hall of Famer Gilmour, who was briefly a teammate of Gartner with the Toronto Maple Leafs, didn't score like him but was a superb playmaker and one of the most relentless players in history. The first player ever drafted by the Minnesota Wild still holds many of the franchise scoring records, even though he joined the New York Rangers three years ago. He's broken the 40-goal mark in two of those three seasons -- including 2011-12, when he scored his 300th regular-season goal and the first triple-OT playoff goal by a Rangers player in 41 years. There will never be another "Mr. Hockey." Howe finished among the NHL's top-five scorers for a mind-boggling 20 straight seasons. His career marks for goals, assists and points have fallen, but the combination of strength, skill and grace that kept him a hockey icon long after his five-decade career ended in 1980 will never be forgotten. Bobby Hull was the NHL's poster boy in the 1960s -- his speed and booming shot thrilled fans and terrorized goaltenders. But his 610 NHL goals were 131 fewer than his son Brett, whose quick release and soft hands turned on the red light 741 times, third on the all-time list. Hall, a longtime teammate of Bobby Hull in Chicago, had 407 wins and set a record that will never be broken by starting 502 consecutive regular-season games. Hasek's brilliance often defied numbers; his career totals are lowered because he got a late start to his NHL career. Hossa is nearing impressive career achievements at age 33. The Chicago Blackhawks forward needs 22 games to reach 1,000 and 74 points to get to 1,000. He's 71 goals away from 500 -- a mark he should blow past well before he retires. The Calgary Flames' captain has lapped the field among players whose last name begins with "I." Iginla passed the 1,000-point mark in 2010-11 and the 500-goal barrier last season. He's the face of the Flames and the greatest player in franchise history. Latvia's first NHL goaltender didn't make his debut until he was nearly 25, but he still found time to win more than 200 games and lead the Carolina Hurricanes to the 2002 Stanley Cup Final. Iginla was the only player whose surname began with "I" who was an NHL regular last season, though teammate Leland Irving did serve as a backup goaltender.